Bangkok is the capital and largest city in Thailand. One of Asia’s most cosmopolitan cities, Bangkok features modern buildings with awe-inspiring architecture, magnificent temples and palaces, authentic canals, and busy markets on trips to Thailand. Bangkok is located in Thailand’s central plains, along the Chao Praya River delta, which empties into the Gulf of Thailand, approximately 25 kms south. Chao Praya River meanders through Bangkok from north to south, and once played an important role to the city’s inhabitants. The Thai capital since 1782, Bangkok was once a village situated on the west bank of the Chao Phraya River. Because of its ideal location near the mouth of the river, Bangkok served as a customs outpost on both sides of the river, and gradually expanded economically through international trade. Before the 19th century, life took place along the river. Bamboo huts were built as dwellings, and while bamboo rafts served as transportation, floating markets selling fruits and vegetables had business conducted on the river itself. Bangkok was considered the ‘Venice of the East’, with its various canals. As Western influences took over Asia in the 19th century, Bangkok started replacing some of the canals with roads, and the region expanded rapidly after World War II. 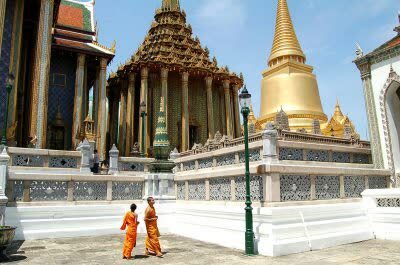 Although quite the modern metropolis, Bangkok offers historic cultural attractions such as the Grand Palace, Wat Pho (home of the Reclining Buddha), and Wat Arun – just three of the 400 Buddhist temples in and around the city to be seen during Bangkok tours on aThai vacation. Full of contrast, a river canal cruise offers tourists a glimpse into what remains of the old way of life by the local Thai people, while world class hotels featuring gorgeous gardens and swimming pools line the banks of the main river. Bangkok is a shopping mecca. Whether it’s a modern shopping mall carrying brand names or a local night market where bargaining is almost considered a sport, there is something for everyone, including silk, gemstones, bronze and pewter. One of the most exotic cities in the world, featuring friendly smiles, fascinating attractions, and a bustling nightlife, Bangkok is one of the most memorable and colourful places to visit on a Thailand vacation.